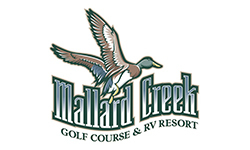 Mallard Creek Golf Course is one of 11 participating golf courses in the Salem / Eugene Mid-Valley area. The Passport rate at Mallard Creek is $25 for 18-holes (with a cart) and can be used once during 2018. Brief Description: Mallard Creek is an 18-hole championship golf course that winds through the foothills of the Cascade Mountains in the Santiam River drainage basin. The bent grass greens and fairways are skillfully maintained and provide a fair and enjoyable test for all golfers. Driving Directions: From Interstate 5, the easiest way to reach Mallard Creek is to take exit #228, the Corvallis/Lebanon exit. Take Highway 34 East into Lebanon and turn right on Highway 20, which is Main Street. Proceed approximately 1/2 mile to Grant Street. Turn left on Grant Street and go out of town and over the Santiam River. Immediately after you cross the river, take a hard right turn onto Berlin Road. Continue on Berlin 6.1 miles and you will see the golf course on your left. Turn left on Bellinger Scale Road and then left again into Mallard Creek.Total time from the freeway is about 20 minutes.